Seoul Viosys, a leading global provider of UV LED Solution, announced that its product named UV WICOP which combines Seoul Semiconductor’s WICOP LEDs with compact and high efficiency technology have been launched. The patented WICOP of Seoul Semiconductor is the world’s first product that does not require the packaging process. It has been designed using a single chip and phosphor only without any components such as lead frame and gold wire. Seoul Viosys has applied the technology to its UV LEDs and has been granted the patent for the combined technology. Conventional UV LEDs have high manufacturing costs due to the additional components and its performance is also degraded by the overload of heat emitted from each component. 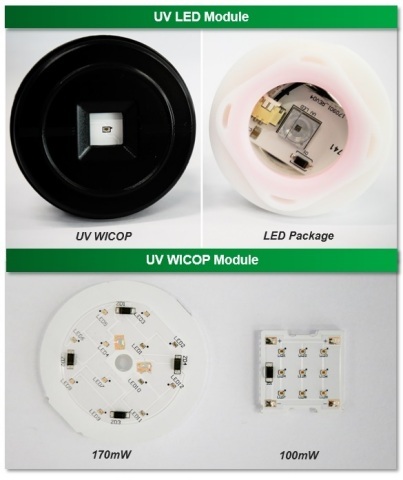 However, UV WICOP has achieved low cost by delivering only a single chip without additional components and it is effective for heat dissipation. The design can be changed easily depending on the applications or customer needs. Seoul Viosys has tested its performance by applying UV WICOP technology to various applications for water and air purification, surface disinfection. As a result, the new UV WICOP has improved performance by more than 600% with a lighting duration time of 45,000h compared to conventional high-powered LED packages that have its 2,000h to 7,000h. The price of the product has been 80% lower than those of the competitors that offer equivalent performance. “Conventional UV LEDs have difficulty in expanding applications with low light power, short duration time and high price. The new UV WICOP of Seoul Viosys is expected to be a leading product that meets the needs of customers and contributes to market expansion for UV LED,” said Jong Man Kim, UV development executive vice president of Seoul Viosys.